Now let's get to the good news. The good news is that natural medicine can save your life. If a pandemic strikes, Tamiflu supplies will be tightly controlled. Unless you're an emergency worker or a health care worker, your chances of ever being given Tamiflu are rather slim. Vaccines, of course, will be utterly useless once the influenza virus mutates, so even receiving a vaccine shot offers no protection other than what's available through the placebo effect. In fact, there's no such thing as a plant that does not contain anti-viral medicine. 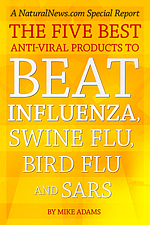 EVERY plant on our planet manufactures at least one anti-viral medicine in its own cells. Did you ever wonder why? It's because plants are under constant attack by viruses, too. And if they don't create their own internal mechanisms for dealing with viruses, they will not survive. This is especially true with plant roots, which are immersed in soil that's rich with both bacteria and viruses. If those roots do not possess anti-viral and anti-bacterial defenses, they will quickly be consumed and destroyed, killing the plant.